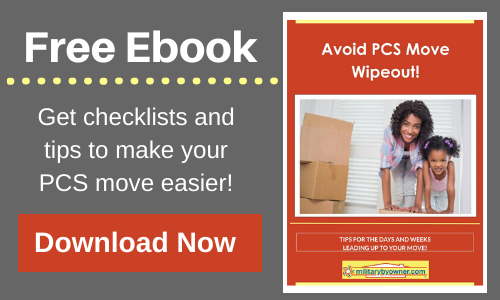 Download Your Free E-book: Avoid PCS Move Wipeout! Are you dealing with a PCS soon? Whether it’s your first move or tenth, planning is key. You may be asking yourself questions like the following: Should I move myself? How can I help my kids cope? What can I do now to prepare? With helpful tips and information, let MilitaryByOwner help make these pre-move weeks and months easier! Why wait? Download your FREE e-book today! Just click the button below.